National Addictions Awareness Week (NAAW), November 12-18, 2017. Why “Words Matter” with substance use and addiction Words have a powerful impact on the way we see the world, and can perpetuate the stigma of substance use. The words we use can have a negative impact, even if we have no intention of causing harm. What is stigma? 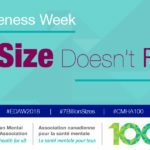 Stigma marks a person as different […]Continue readingNational Addictions Awareness Week (NAAW), November 12-18, 2017.